For at least ten years I’ve had scraps of ribbon hanging around. I’ve gotten ribbon grab bags at places like Hobby Lobby or Gardenridge or Big Lots. I love to look at them, play with them, tie up lovely packages, use them for random tasks like tethering the kid-proof cabinet lock key near the related cabinet. But I have always had a problem figuring out what to do with them. They jumbled up and made a mess and tangled and it was hard to tell how much I had of a color and keep them all together. I tried rolling them up and pinning them a la Martha, but the pins don’t stay easily, it leaves a pinhole, and you can’t tell how much of it you have. I tried hanging them on a tie hanger, a standard coat hanger, winding them around wrapping paper spools, rolling them about jumbo embroidery thread-type holders and finally just rolled them up and squished them into a shoebox because I was just annoyed with my inability to think of a reasonable solution. And finally, it came to me. I can organize by color, pull just one out when I want it, and move them all easily from room to room and from place to place within a craft area. Easy to replace one if I decide not to use it. Lots of room for plenty of new ones. Aaaah, so satisfied to have solved the problem with a simple pant hanger. Make a simple loop, once around the hanger, through the loop, pull the length through. Stand back and admire. Have a little chocolate treat to congratulate yourself on solving a long-term problem. Shake your head at yourself for not coming up with it sooner. Say, 9.5 years ago. That is brilliant! And I don’t even use ribbon. What a great idea! I am a sucker for a good ribbon tip!!! Way to go!! I am going to add this to my blog right now! Thanks for emailing me this link! Wow! What a fabulous idea!! Brilliant!! And I happen to have one of these pant hangers in a bag to go the Salvation Army. It’s rescued!! Wow, that beats keeping them in a cardboard Avon box! Great idea! 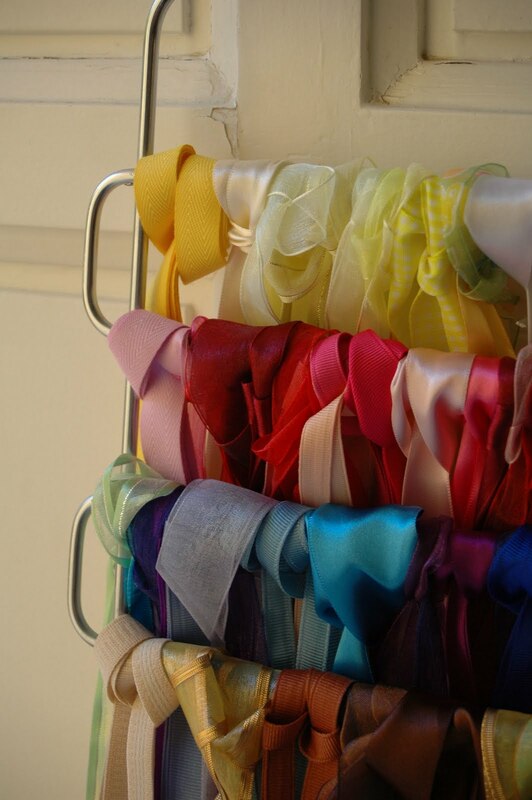 no hassles trying to find what ribbons to use and all colors are seen easily. 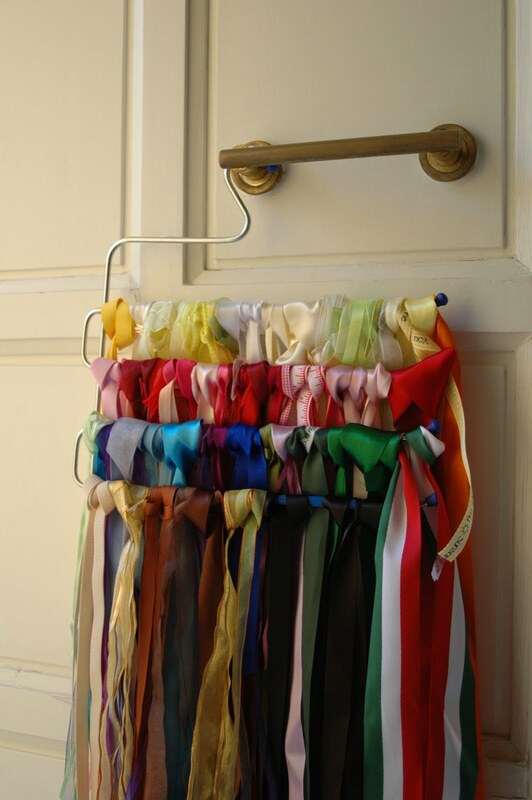 I would think of using such a hanger for scarves, never before for ribbons and other haberdashery items. Thanks for sharing & your blog looks lovely.